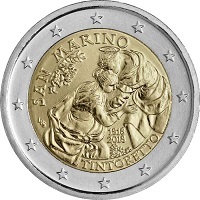 Details relating to the San Marino Commemorative of 2018. Mint: Instituto Poligrafico e Zecca dello Stato S.p.A.,Roma. This coin commemorates the 500th Anniversary of the birth of Il Tintoretto. The name Il Tintoretto (The Dyer) was taken from the craft exercised by his father – his true name was Jacobo Robusti and his painting style was seen as a forerunner of the Baroque style. The motif in the inner circle is taken from his painting “The visitation of the Virgin” and portrays the meeting of a pregnant Maria with her relative Elisabeth. Maria is seen bending to embrace Elisabeth. Both are adorned with halos and Maria wears a garland of roses on her head. On the edge on the inner circle, from nine to one o’clock is the inscription “SAN MARINO” and directly thereunder is a sprig from a laurel tree. Just below the sprig is the mint mark ”R”. From seven to four o’clock we see the inscription “TINTORETTO” and immediately above this are some small incense branches. The designer’s initials appear between eight and nine o’clock. The year of Tintoretto’s birth 1518 and the year of issue 2018 can be seen above the incense branch. Return from San Marino Commemorative 2018 to euro coin collector.